Microsoft’s Delve app started out as a visual representation of the people and data you interact with at work. The upcoming version of Delve adds a new feature that will track how much time you spend on work-related activities. Creepy? It certainly could be. Julia White, general manager of the Office team, demonstrated the new features Monday at Microsoft’s Ignite conference in Chicago. Earlier in the day, Microsoft had already announced a new consumer preview of Office 2016, as well as a new Windows 10 update program for businesses. While Microsoft’s Build conference last week was aimed at developers, the Ignite conference is aimed at businesses. 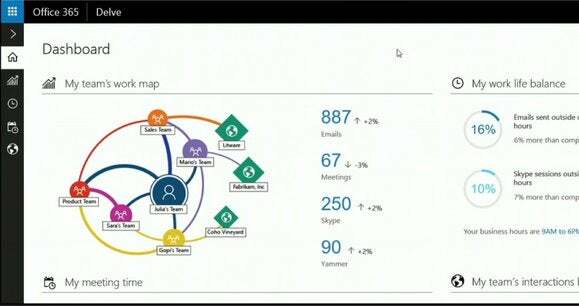 And that’s also the purpose of the Delve app, which is designed to “surface” the relationships you have with others in your organization. In concrete terms, Delve should help you find the documents you need quickly, and also discover who in the organization has the resources and knowledge you need. 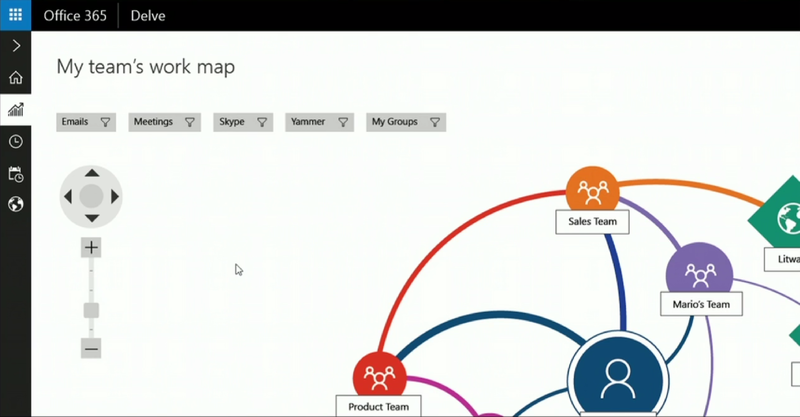 The work map within Delve shows the relationships between individuals and teams, based on the thickness of the lines between them. The story behind the story: Employees may understandably have mixed feelings about this new tracking component of Microsoft Delve. Americans reportedly take only half of their allotted vacation time, apparently afraid they’ll be seen as less committed to their jobs than their coworkers. However, a company like Microsoft might actually look at statistics about the average time spent at work-related tasks, conclude that some workers might be burning out, and order them to take some time off. Is this Microsoft Office Space? “Essentially, think of it as your health tracker for your work,” White said, during the Delve keynote. “And I can tap into all that information in the Office Graph—all those signals—to understand my time, the interactions and that of my team, as well. I even have things like work-life balance too see how many emails I’m sending out of office time. And then if I go down here I can see the amount of time I spend in meetings—and man, I’m at 60 percent! 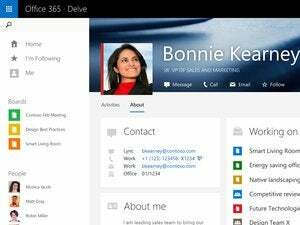 The new Delve app doesn't have a version number; Delve is an "experience within Office 365," according to a company spokeswoman. What White showed off was a preview of the new organization view, the spokeswoman said. And in the example Microsoft showed, you won't be able to see exactly how other specific coworkers perform, she said. "We do see value in organizations measuring various individual social analytics (like network size, time spent with customers) against performance data to look for trends and predictors of individual and org success," the Microsoft spokeswoman said in an email. "But that visibility will be driven by user and organization level opt-ins, not enabled by default." Is Delve digging too deeply into your workday, or is Microsoft providing a valuable service? Let us know in the comments.